Auction Decorating: Dare to be rustic! I love designers and home owners that have the courage to use rustic, vintage, even beat up, pieces of furniture in a confident way. This opens up all sort of opportunities to find great pieces at auctions for a song! 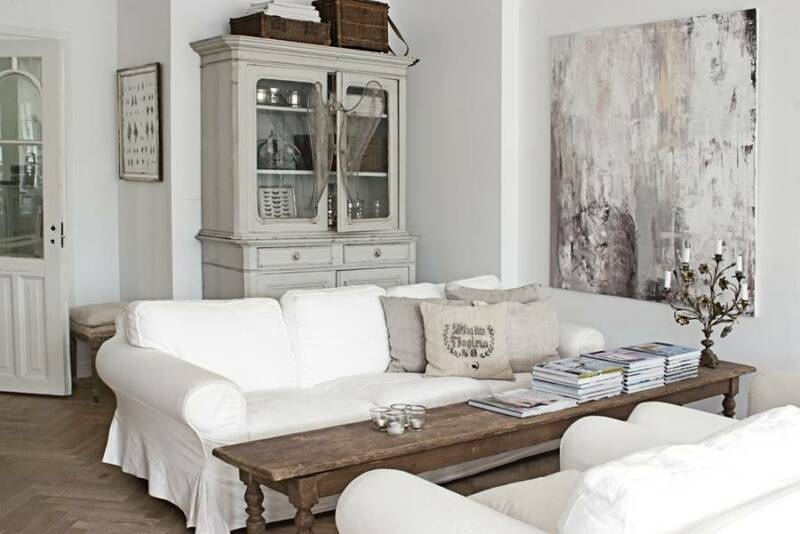 In this Swedish home, the home owner has a passion for vintage, and it all ties together in a simple white scheme with touches of browns. 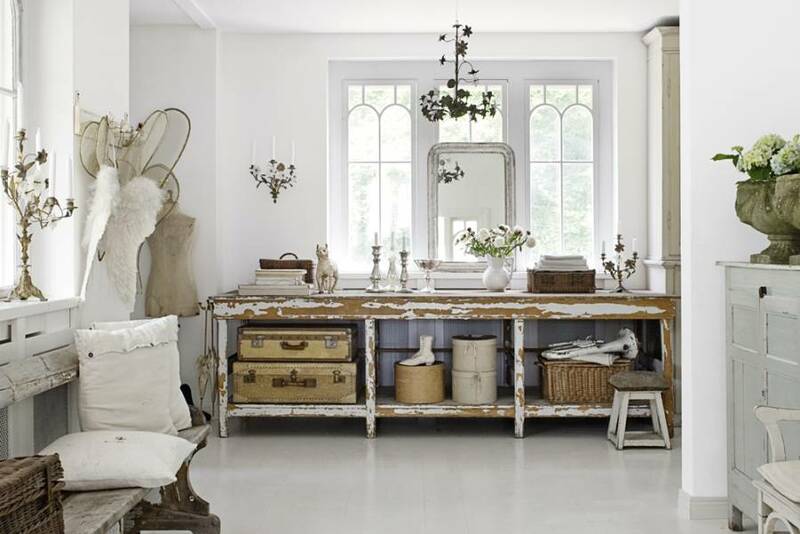 The top photo of the entryway shows a pealing console table with vintage luggage on the shelves. It's dressed up with a chandelier and elaborate wall sconces. 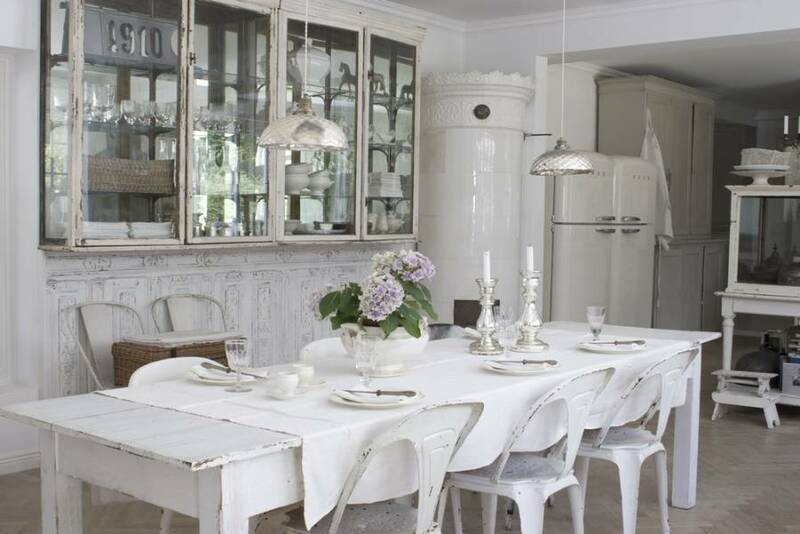 The dining area includes a painted farm house table, and industrial chairs. While the living room uses a vintage bench as a coffee table and a wonderful old cabinet for display and storage. 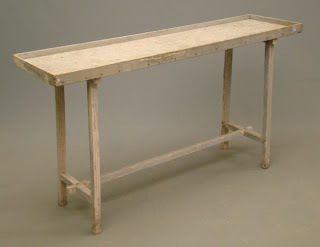 If we start with the entryway, this primitive wood sorting table would make a wonderful console table. This sold at a Copake Auction in Copake, NY for $80 off an auction estimate of $40 - $60. This is painted a chic gray, and measures 60 inches wide. 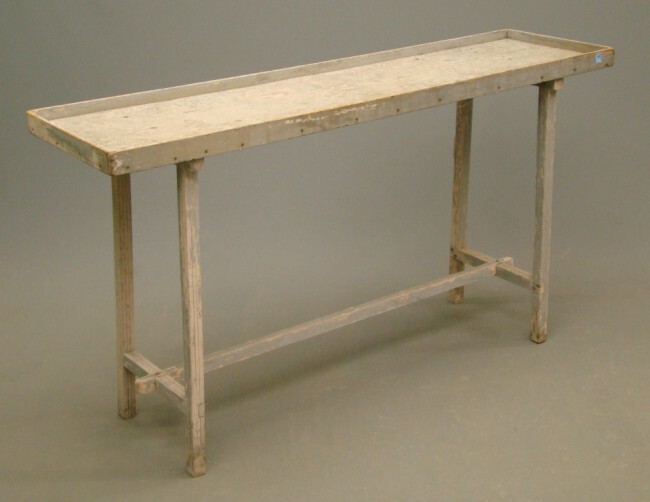 Copake was also a great place to pick up a farm table to put in the dining area. 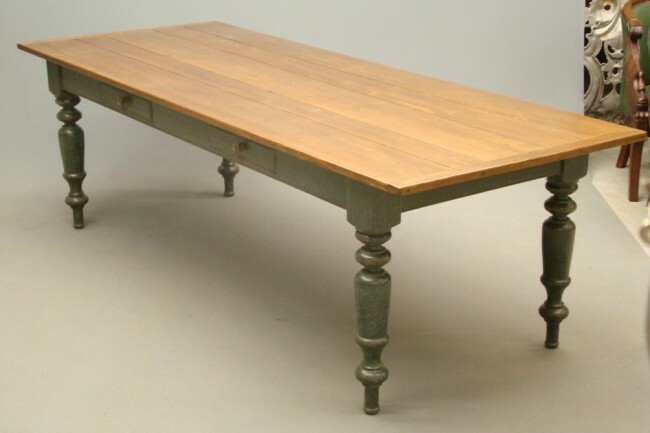 This benchmade Quebec table sold for $900 off an auction estimate of $1,000 - $1,500. It measures 38 inches wide by 100 inches long. It has a wonderful wood top, and green painted base. This would comfortably sit eight. 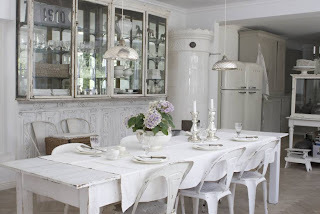 Just find some industrial chairs for the look in the Swedish home. 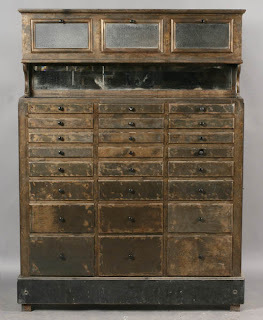 I love this vintage metal medicine cabinet. This would be a terrific piece of furniture in the living room, used for storage and display. It has lots of drawers, a shelf, and three drop front doors. 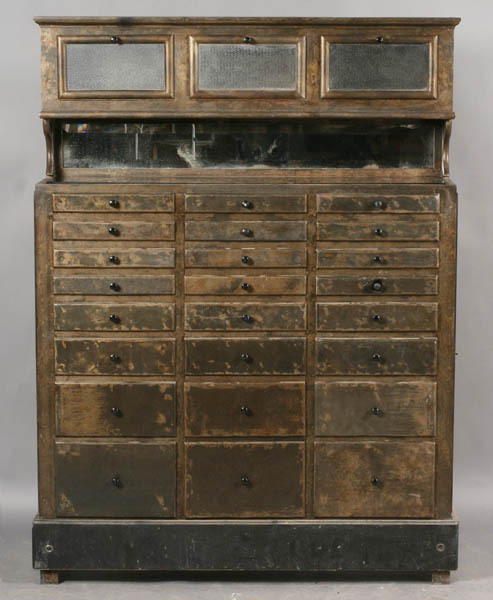 This is circa 1900, and sold at a Kamelot Auction in Philadelphia, PA for $850. I'm in to rustic benches! 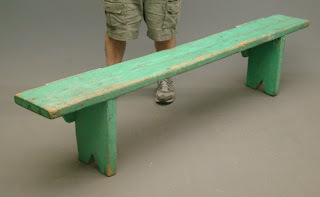 This green painted bootjack bench would be great as a coffee table like the one in the photo above, or as a bench in the entryway for a place to sit to take off your boots. It's 78 inches long and sold at a Copake Auction for $70 off an auction estimate of $75 - $125. 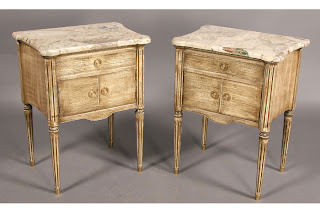 At a Kamelot Auction this pair of French end tables sold for $300. 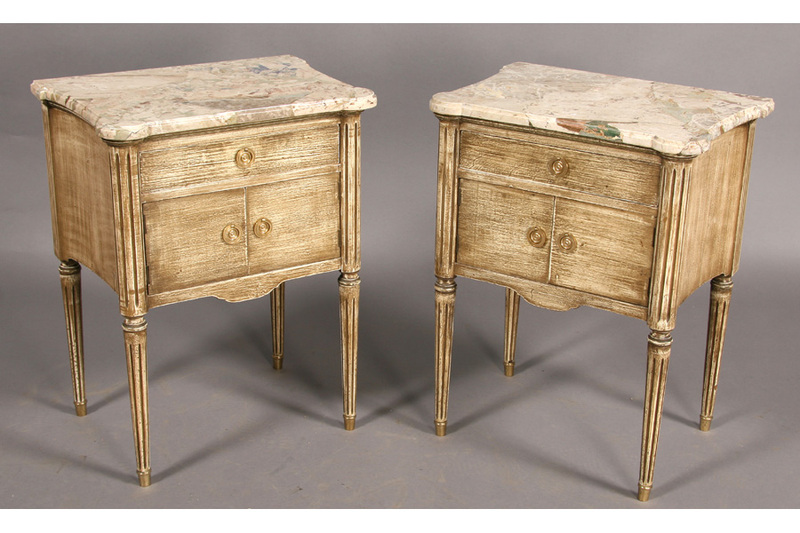 They have a wonderful faded paint patina and marble tops. These are circa 1940. Buy an Ikea sofa with a white slip cover, place the end table, the bench coffee table, and the medicine cabinet for an instant chic room for under $1,500. More than enough left over to add a couple of comfortable chairs! I love the rustic look, and with just a little courage you can have a chic home for not too much cash. Think about adding something glamorous for contrast, like an elaborate chandelier or a pair of sconces. I did look at your website and passed it on to my daughter at Mark Hampton. They could probably use an armload! We are excited to be included in HGTV's Freebie Friday giveaway tomorrow. We are giving away a cool Asian lacquer coffee or low side table in one of 5 color options, so come on by for a chance to win!! Its worth upwards of $500.00 so its our biggest yet.